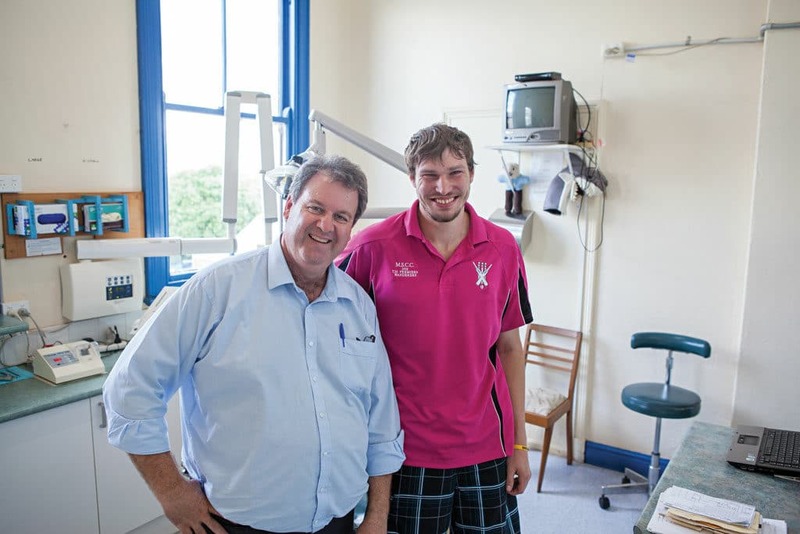 Dr Brett Phillips aims to provide dental care to those “adding value to the local community”. Last year’s severe drought further tested the residents, and if that wasn’t enough, a ferocious hail storm all but tore the town apart in September 2018. It flooded shops, brought down trees and power lines, and the roof was ripped off of a council workshop and hurled 50 metres down the street. Dr Phillips has been practising in Childers for 25 years. He operates out of a 125-year-old building that claims the title as Australia’s oldest continuously running dental practice, and now he’s determined to give back to the town that has withstood so much hardship. “Childers is one of the lower socio-economic areas in Australia, and so many people do so much for the community that there’s not always enough money left over for them to look after themselves,” he says. That’s a common story in rural Australia, and one that is impacting on dental health around the country. According to the National Rural Health Alliance, people living in rural areas are more likely to suffer complete tooth loss, wear dentures and have untreated coronal dental decay than those who reside in capital cities. In fact, 31.7 per cent of rural Australians have untreated tooth decay, and 32.8 per cent are suffering from moderate to severe periodontal disease. And in Childers, the waiting list to see a public dentist is more than two years. “Consider that one in two children have dental decay, and you can see that this is the beginning of a huge dental epidemic,” says Dr Phillips. It’s figures like these that have motivated Dr Phillips to make a difference in Childers. He entered Sunsuper’s Dreams for a Better World program with his ‘Decay Slayer’ concept that aims to offer free dental care to the most deserving residents of Childers. He has been named among the three finalists and awarded $5,000. If he wins the grand final in February, he’ll win an additional $10,000. “The $5,000 allows me to offer free dental treatment to 15 patients, and if I win the grand final I’ll be able to treat another 35 patients,” he says. The ‘Decay Slayer’ program has already helped one Childers resident get a set of dentures, and another had some much-needed crowns put in. But Dr Phillips says a free treatment could be as simple as an exam, clean and maybe a filling. “I really want to choose people who are adding value to the local community,” he says. “Many of the patients I choose do a lot of volunteer work. One of my patients cooks and cleans for pensioners, and another dedicates herself to caring for her autistic child. And there’s the kid that works 11 days a fortnight at the local IGA, or the ex-farmer who’s still doing it tough after the latest drought. While Dr Phillips isn’t motivated by self-interest, he says that dentists can use free appointments to boost their community standing and help to build their practices. And Dr Phillips isn’t asking for the world. He says that just one free appointment can make a significant difference in a person’s life. “It’s simple really. I’m part of this community too, and right now my community needs a hand so it’s time for me to step up,” he says. “Dentistry is an honest and honourable profession, and as dentists, we could all band together to help eradicate decay. “If we can all try to reach out and help people in our communities—even if we all just offered one free appointment on one day every year—that’s a lot of people receiving dental treatment that they couldn’t otherwise afford.